Ice candles are so strange and interesting, no one looking at them can quite figure out how they were made. The technique is very simple and will make a unique candle every time. 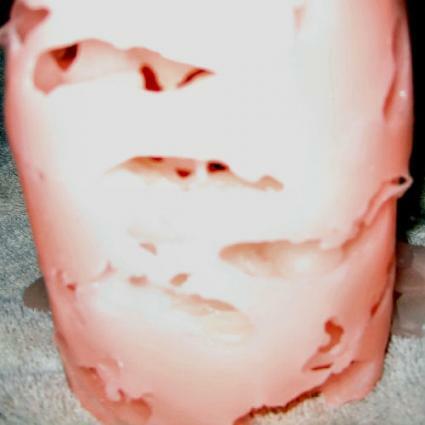 Melt the wax as you would for any project, adding color and fragrance if desired. I have made colored ice candles before, but it doesn't make a lot of difference if you scent the wax because the taper candle is what will be burning when you use the candle. If you want a scented candle, buy a scented taper or put a drop of essential oil in the well of the candle when you light it. Prepare the mold by placing the taper candle in the center of the mold. Surround the candle with ice cubes. If you don't like the shape of ice cubes your ice machine or trays make, break the ice up a little bit with an ice pick or hammer. The idea is to have lots of different shapes going on. The mold should be full of ice, but not packed. There needs to be room for the wax to fill in around the ice. Setting up the mold should be done as close to the time of pouring as possible because the ice will melt. Put the mold in a pan with sides lined with aluminum foil in case of wax leakage. Because there is no mold sealer in use, it is possible that some wax could leak out the bottom of the mold. This isn't likely because the wax hardens very quickly, but insurance against a mess is always a good thing. Carefully and quickly pour the melted wax into the mold. Expect dramatic noises as the hot wax hits the cold ice. The wax will start hardening and the ice melting instantly. Let the candle set up for a few minutes before attempting to pour off any of the water. Again, some water may leak out the bottm but you will have to pour the water off from the top.You'll probably want to pour the water off a couple of times as the rest of the ice melts before taking the candle out of the mold. When you remove the candle, it will be full of holes shaped like the ice. Simply light the taper to burn the candle and the light will glow through the ice-shaped wax as it burns. The shell of the candle may remain intact, in which case you can just slide another taper candle in the hole left by the first one after it burns away. Ice candles are a very cool (if you'll pardon the pun) way to decorate for a party. The candles will be quite the conversation piece as your guests try to figure out what made the interesting shapes. Because each candle is different, they are great to give as gifts. They can be somewhat fragile, though, so it's probably not the best choice for a gift that has to travel a long distance or by mail. Ice candles are a fun way to introduce children to candle making (always supervised, of course). They will love the way the candles look and knowing the secret that makes them look that way. It's also a pretty good lesson in what happens when you mix hot and cold things. Ice candles are just a really fun, easy candle project that you will love to do. They set up more quickly than regular candles because of the extreme temperatures and don't need topping off because they are supposed to look uneven and irregular. So if you need a homemade gift for someone quick, consider making an ice candle. You'll be hooked.